PCOS is one of many hormonal and menstrual problems discussed by Alisa Vitta. In a recent talk, she highlighted a very important point that conventional gynecologists simply use birth control to mask problems with the menstrual cycle instead of fixing the root cause - which takes exploring micronutrient deficiencies, toxin exposure, hormonal imbalance, lifestyle irregularities, and food / nutrition choices. This includes PMS, dysmenorrhea, amenorrhea, endometriosis, fibroids, and acne. For heavy painful periods she mentions that women should primarily focus on food balancing, and then secondarily can consider supplements like DIM, liquid chlorophyll, and milk thistle. Both strategies can help correct estrogen / progesterone imbalance which is at the root to many menstrual problems. 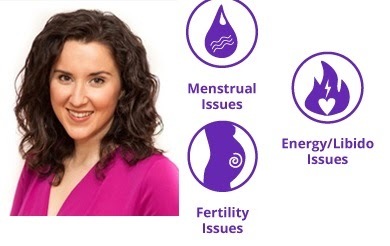 Dr. Aviva Romm also discusses women's health issues with a strong integrative perspective.